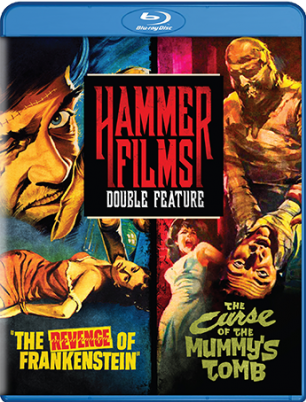 This is Part Two of my review of Mill Creek’s Hammer Films double features. Go to Part One to read my introduction and reviews of the The Gorgon and The Two Faces Of Dr. Jekyll. 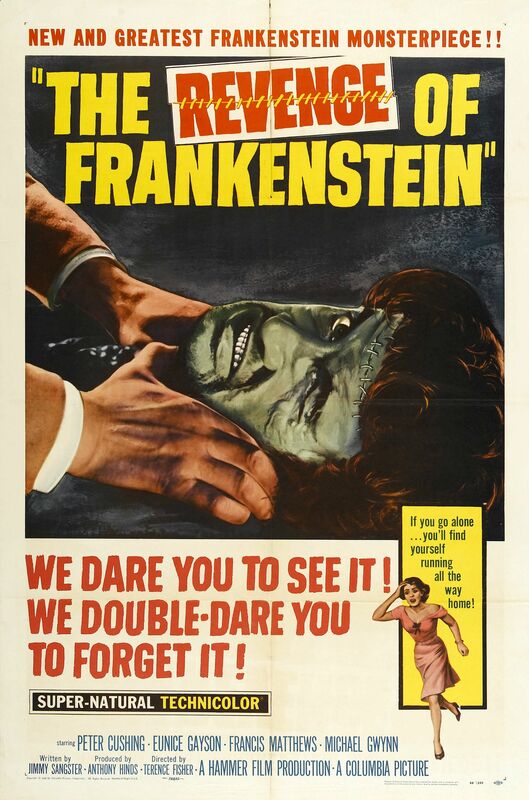 THE REVENGE OF FRANKENSTEIN (1958): Hammer Films made six Frankenstein films and this one is the first sequel. It takes place three years after the events of Curse Of Frankenstein (1957), where Dr. Frankenstein (Peter Cushing) has been in prison waiting to be executed for the rampage his monster created in Curse. But he had an “out” for himself which gets put into play the moment he’s taken up to the gallows. Someone does lose their head, but it’s not the doc, and that body is buried in the coffin meant for him. Under the alias of Dr. Stein, the mad doctor sets up residency in another town and goes about trying to recreate his experiment. He works helping the poor and in this position he has great success in procuring body parts. He has an “Igor”-type character at his side, Karl (Oscar Quitak), with a hump and a paralyzed arm, and the Doc has promised to take his brain out and put it into his “monster.” The “monster” (Michael Gwynn) in this version looks a lot less monstrous than the one he created years before. Outside of the scar across it’s forehead it could pass perfectly for a human being. Eventually Victor gets a proper assistant, Hans Cleve (Francis Matthews), another doctor from town and he knows who Dr. “Stein” really is. What he seeks, though, is knowledge and to help. For the most part the transplant of Karl’s brain goes off beautifully and days later the “monster” is awake, communicating and seemingly showing us all that Frankenstein can pull off the creation of a benevolent being. But, and there’s always a ‘but’ in situations like this, Kleve mentions to the “monster” he’s going to be important to science now. “New Karl” doesn’t want that kind of attention and breaks out. Hard to tell where things go wrong. He takes a beating from janitor at the lab, which may have injured his brain. After that he turns homicidal, kills the janitor and begins to transform into his former self, where the hump, the paralyzed arm and his blind eye are concerned. Frankenstein’s monster just outright dies during an attack at an upper class gathering, but before he does he calls Stein by his real name. Like before Victor always seems to have a “get out jail free” card up his sleeve. Earlier in the movie he put together another body and put it on ice. Once word gets around that he’s the infamous Frankenstein his patients in his ward gang up on him and nearly beat him to death. Actually, they do, but he doesn’t die there, but in his lab after Kleve rescues him. Kleve then transplants Vic’s brain into that new body he had on ice and— voila!—Baron Victor Frankenstein is born again and looking exactly like his old self save for a fading scar across his forehead. He and Kleve move to London and take up their experiments anew with Vic using the alias of Dr. Franck this time. THE CURSE OF THE MUMMY’S TOMB (1964): Hammer Films made four Mummy movies, but I don’t believe there’s any continuity between them, though I can’t be sure of that since this film here is the only one I’ve seen. 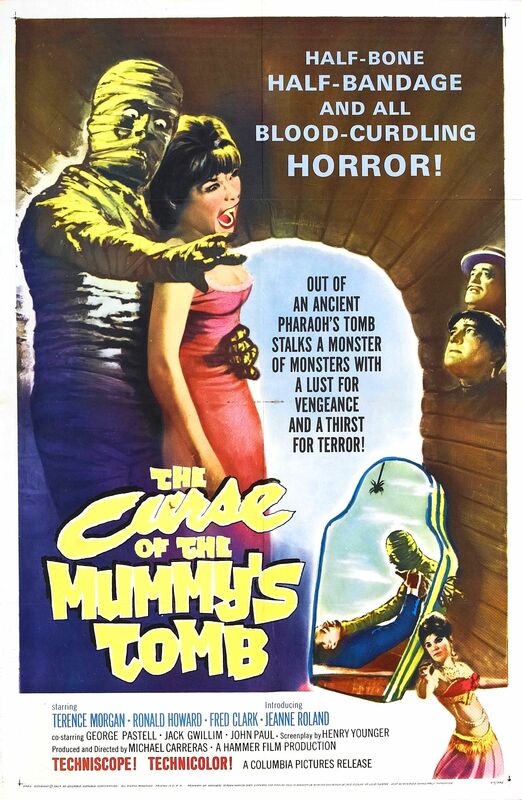 Curse Of The Mummy’s Tomb is the second movie in this “series,” coming in behind The Mummy (1959) and it concerns two brothers from ancient Egypt. One of them was banished and eventually murdered; the other was cursed by his father to forever walk the earth. His modern day alias is Adam Beauchamp (Terence Morgan), an expert in ancient Egypt for obvious reasons. The only way for him to die is at the hands of his brother, which poses a hell of a problem since he’s dead and mummified. He’s the marauding mummy (Dickie Owen) of our movie. Adam has had it up to here with eternal life and just wants to push up daisies, but he being the real villain he has to make it difficult for all around him to continuing living. There’s an ancient amulet he’s been searching for that will resurrect his brother, and that’s where we are introduced to our Egyptologists (the ones responsible for unearthing Ra-Antef): John Bray (Ronald Howard), his fiancé Annette (Jeanne Roland), and senior Egyptologist, Sir Giles Dalrymple (Jack Gwillim). There was one more, but he was killed right in the beginning by natives and had his hand chopped off. Once the tomb of Ra-Antef is discovered Egyptian official, Hashmi Bey (George Pastell), tries to dissuade them from putting the damn thing on display thanks to American promoter, Alexander King (Fred Clark), who also wants to tour America with it once its London shows are done. Adam ingratiates himself upon the group quickly and even gets Annette to break up with John, but the curse of the mummy dictates all who look upon it once his tomb is opened are destined to die and all three of these characters are gazing at it when that moment comes. Naturally, once Ra-Antef is revived he goes about offing them all. I liked King too, but he’s the first to get it, and poor Bey has his head stomped and crushed, off camera, of course. The only reason Adam took Annette away is for his ceremony. Thank Anubis, though, the mummy was not without morals. He disobeys Adam’s command to kill her and instead kills his brother. All this comes to a head in the sewers of London where the mummy then kills himself by forcing a collapse of the tunnel he’s in taking with him that amulet. The Curse Of The Mummy’s Tomb had a previous DVD release in that aforementioned Icons Of Horror: Hammer Films set, and Revenge Of Frankenstein got a solo release on DVD from Sony way back in 2002, and re-released on DVD in 2013 by Mill Creek in a 4 Movie Collection, but this double feature marks both of their blu-ray premieres! The best looking transfer in this set is Curse Of The Mummy’s Tomb. I was never a fan of the Frankenstein or Mummy mythologies, but at least Revenge Of Frankenstein and The Curse Of The Mummy’s Tomb was more entertaining than The Two Faces Of Dr. Jekyll. If I had to rate the transfers on all of them, The Gorgon is the best of them all, with Curse/Tomb and Dr. Jekyll coming in third and fourth place respectively. The worst one was Revenge Of Frankenstein looking more or less like a DVD to me. On the plus side both double features are extraordinarily cheap and worth it if you’re a fan of either The Gorgon or The Curse Of The Mummy’s Tomb. Gallery | This entry was posted in Hammer Films Double Feature (The Revenge Of Frankenstein/The Curse Of The Mummy's Tomb) U.S. Blu-ray. Bookmark the permalink.